Lok Sabha is the Lower house of the Parliament of India, and literally means the ‘House of the People’. Lok Sabha, along with the Rajya Sabha and the President of India, makes up the Parliament of India, which functions as the heart of the government of India. The name Lok Sabha is derived from Sanskrit. The term ‘Lok’ means people and ‘Sabha’ stands for assembly, so both these terms put together gives ‘Assembly of the People’, or ‘House of the People’. The members of the Lok Sabha are nothing but the representatives of the different parts of India, from where they were elected to power. Composition of Lok Sabha: The Lok Sabha has been allotted a maximum of 552 seats by the Constitution of India, keeping in mind the population to constituency ratio of all the states and union territories of India. Out of these 552 seats, a majority is represented by the 28 states of the country, i.e. 530 seats. Twenty seats are represented by the 7 union territories of India, which leaves out just two more seats in the house. These seats may or may not be reserved by the President of India for the Anglo-Indian community. If the President feels that the community is well represented without the inclusion of these two seats, he/she may keep them vacant, but if the President feels a need for any such representation, the same is facilitated by appointing members for these two seats. 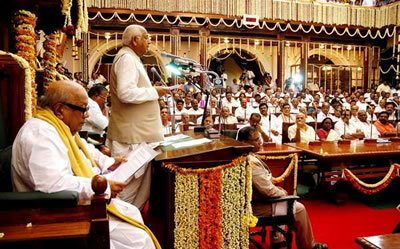 Presiding officers and members: The Lok Sabha is always presided over by a Speaker of the house. The Speaker is responsible for ensuring normalcy in the house and observing peaceful proceedings. The Speaker is also assisted by the Deputy Speaker, who assumes the role of the Speaker in an event of the latter’s absence. The members of the house must always respect the Speaker and carry out his instructions whatsoever. He/She is a citizen of India, and makes and subscribes before some person authorized in that behalf by the Election Commission of India an oath or affirmation according to the form set out for the purpose in the Third Schedule of Indian Constitution. He/She possesses such other qualifications as may be prescribed in that behalf by or under any law made by Parliament. Powers of the Lok Sabha: The Lok Sabha along with Rajya Sabha is responsible for helping the incumbent government at a given point of time to effectively administer laws and observe harmony in the country. The Lok Sabha has its basic functions on the same pedestal as the Rajya Sabha. The Lok Sabha is also responsible for debating and discussing various Parliamentary bills in order to make them into laws or legislations. It is also responsible in partnership with the Rajya Sabha to make necessary amendments to the Constitution of India, as and when required. Fundamental powers like these with the Lok Sabha are very much alike the Rajya Sabha. However, some special powers like passing no-confidence motions against the government and introducing money bills is what makes it prevail over Rajya Sabha, and also makes it different from the latter. Disqualified under Representation of People Act. The above was an account on what Lok Sabha comprises of, and entails.